Notre Dame de Paris stands, like a majestic Gothic flagship, on the Eastern end of the Ile de La Cite, in the centre of the River Seine, at the heart of Paris. In a sense, it’s also at the centre of France, as Point Zero, the designated reference point for measuring distances along the roads leading out of the capital, is located in the square in front. Tradition holds that the visitor who stands at Point Zero ensures a return to Paris. 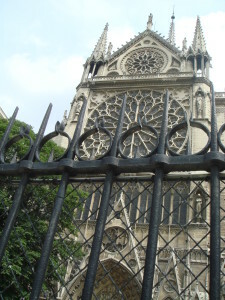 Spiritually, too, Notre Dame is at the heart of Paris and of France. It is home to the Archbishop of Paris and as the Cathedral of Paris, is the city’s largest and foremost place of worship. It has been the stage for many great state occasions, both religious, like General de Gaulle’s thanksgiving Mass at the end of World War II and secular, like the Coronation of Napoleon. Notre Dame is one of the earliest and finest examples of Gothic architecture. Conceived by Bishop Maurice de Sully, Notre Dame took 182 years to build – the duration of the entire Gothic era! The foundation stone was laid in 1163 and it was finally completed in1345. It reflects not only the different ideas and skills of the generations of stone-masons, carpenters, labourers and architects who worked on it but also the developing Gothic movement. The like of the stained-glass rose windows in the north, south and west walls had never been seen before. Neither had the famous flying buttresses, now a part of the majesty of this architecture but which were, in fact, an innovation born of the necessity to support the thinner walls, which developed stress fractures as they rose higher. Like most great old Parisian monuments Notre Dame has been battered by the storms of history. During the Revolution, it was threatened with destruction as a bastion of the detested church and aristocracy. But while its windows were smashed and its statues beheaded – in the belief that they represented the French Kings, the church and it bell were saved. Under the new regime it became a “Temple to Reason” then a warehouse for storing food. In 1845 it was restored and used as a church again. But in 1871, the Paris Commune decided to burn it down. Once more it was saved. In 1939, fearing an attack from German bombers, the then Archbishop had the precious stained-glass windows removed. They remained hidden in safety for the duration of the war. Like all ancient buildings, Notre Dame has been buffeted by time and the elements. In our times, maintenance, repairs and restoration are continuous and the cathedral’s face is often hidden behind an armour of scaffolding and mesh screens. However, Notre Dame was not always so well cared for. During the nineteenth century, it had fallen into such a state of disrepair that demolition seemed likely. Salvation this time came from an unlikely source. The novelist Victor Hugo, a great admirer of the Cathedral, wrote The Hunchback of Notre Dame, the “beauty and the beast” love story of Quasimodo, the hunchback bell-ringer, who lived in the cathedral tower and Esmeralda, the beautiful gypsy who danced in the square below. The novel captured the imagination of the Parisian public and highlighted the plight of the church. A fundraising campaign was begun and Notre Dame was redeemed and restored..
Victor Hugo’s story has become one of the immortal classics, translated into hundreds of languages, retold in thousands of versions, in countless plays and in numerous films, including the charming Disney cartoon. In the process, Notre Dame, too has been immortalized, its fame spread to the four corners of the earth. Millions of tourists come to climb the 387 steps to its tower and to marvel at the stone monarchs of Judea and Israel standing guard on its façade. Pilgrims, Catholic and non-Catholic alike flock to Mass here. Yet, for all the queues, the crowds and the constant movement, Notre Dame is first and foremost, a place of prayer and the spirit. There a smell of incense and lilies, a dim light, pierced by muted rays from the rose windows and deep shadows. There are prayerful, peaceful corners where lighted candles and tokens of petition and thanksgiving bear testament to the faithful. Notre Dame is still a church.